Inscribed with the quote,“It is only with the heart that one can see rightly / what is essential is invisible to the eye,” by writer and pilot Antoine de Saint-Exupéry, Robert Frank’s handcrafted 1952 book, BlackWhite and Things,was made in an edition of three identical copies designed byWerner Zryd, each with a spiral binding containing original photographs of Frank’s travels to cities including Paris, New York,Valencia and St. Louis. First reprinted for an exhibition at the National Gallery inWashington, D.C., in 1994, this edition has now been designed in a smaller format by Frank. 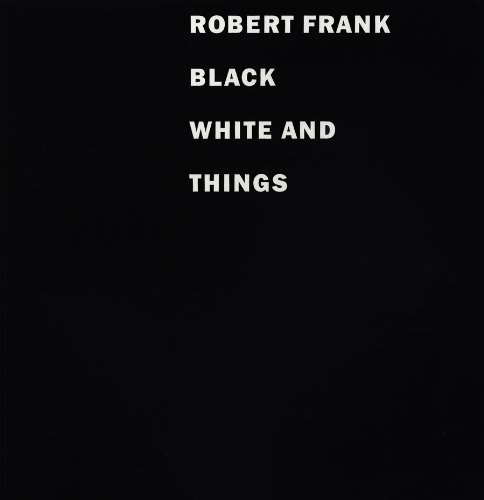 The three categories “black,”“white” and “things,” are shaped more by mood than subject matter: vastly different images—Frank’s first wife reclining with their newborn baby, peasants squatting against a flaking wall in Peru and a business man strolling past a snow-filled tree in London—are all gathered in the “white” section, for example.